The ABS M1 Professional Mechanical Keyboard is not as good looking as the Das Keyboard Model S Professional, but then again, it doesn’t cost nearly as much either. Can this keyboard that embraces simplicity prove its worth in such a competitive market? For one, the ABS M1 is based on the black ALPS style switches, which are tactile but not clicky. This means that you can feel the satisfying tactile sensation but you won’t make too much of a racket once you start hammering away. 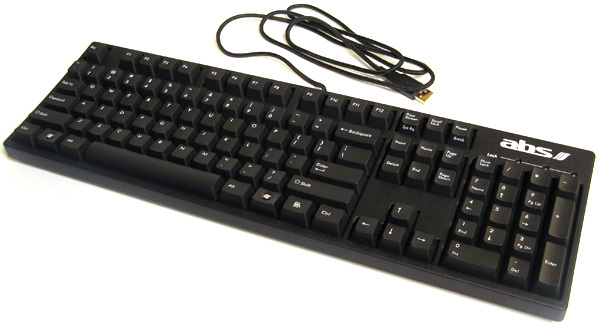 Let’s get some of the boring details out of the way, this is a 104-key keyboard, comes with a gold-plated USB wired connection which is supposed to ensure low latency, which is all delivered in a durable braided cable. ABS states that the keys are tested for gaming-grade usage, up to 20 million clicks. The keyboard’s look shows its intent to be a workhorse and doesn’t have too many frills. The only accents being the light blue LED indicators at the top. The idea behind “gaming” oriented keyboards is that the keys will have low down-force needed to depress the keys, so that they may be pressed quickly and repeatedly in the heat of battle. The ABS M1 does a good job here with its black ALPS style switches, as opposed to the Cherry MX Blues in other keyboards which would be a waste to a gamer because they don’t get any advantage out of the “clickiness.” As I write this, it is a bit difficult to find the ABS M1, currently it is deactivated on Newegg.com, but was found as cheap as $49.99. If you’re looking to get started with mechanical keyboards, but don’t have a lot of money for the higher-end boards, this one is perfect. You just can’t beat the value proposition here, if you can find it in stock.